These are attractive looking cups and match nicely with the new set of off-white dishes I recently purchased from Overstock. I ordered two sets to have a total of eight cups. The cup holds more than most cups so don't need to refill so often. Use this elegant set of Red Vanilla mugs to add a classic touch to your dining table. 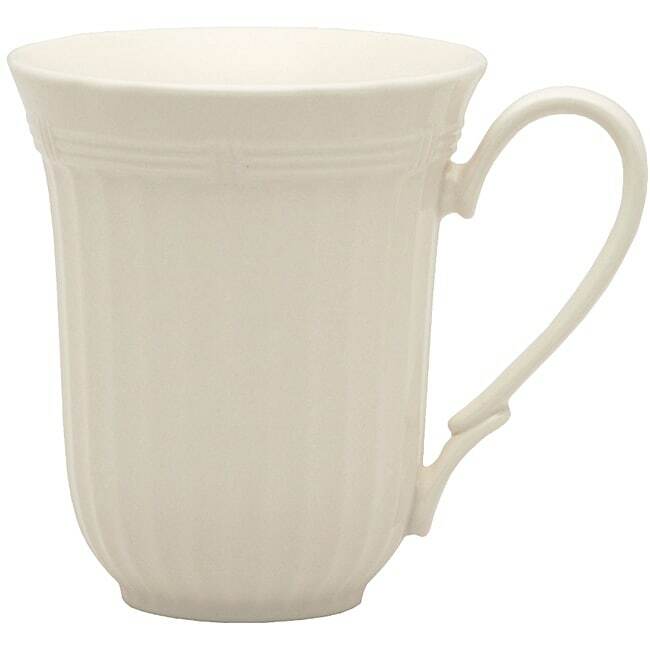 These creamy white mugs are ideal for parties and formal dining, but is durable enough for everyday use. Dimensions: 4.5" x 3.5" x 4.5"
Beautiful mugs and just the right size but the color is a dark ivory, not a light cream color as anticipated. I was not looking for white-white, but this is a rather dark off-white. Otherwise, very pretty and blends well with 1920s period design. This is a nice, lite mug that holds up to every day use without chipping. Unfortunately the description says "white", and that is not correct. These are more cream or antique. These Tuscan Villa Mugs have an elegant look to them. I needed a good looking coffee mug, when serving coffee to my guest. They look great worked in with my china and crystal. I feel like I got a lot of bang for my dollar. Love them! As much as I love this pattern, the mugs have a design flaw. The handles crack right at the bottom a little above where it joins the cup. I bought 8 place settings of the dishes and I am down to 4 mugs. The rest of the dishes (dinner plate, salad plate, bowl and large cream soup bowl) are all good. I don't know when the cracks in each mug handle happens. I am not hard on my dishes and there are no children in the house so there were no accidents. The crack is just there one day. It's painful to throw away an otherwise good cup that wasn't cheap because there is a small crack across the bottom of the handle. I bought 4 replacement mugs in this pattern and when those handles crack, they are being replaced with some other sturdier cup. Too bad since I thought the cups were lovely and graceful looking. This brand is attractive and amazingly durable. We a beach house that we rent so our plates, mugs and bowls get a work out. I'm amazed that after 5 years we have no chips at all in any of the pieces. Highly recommend. These mugs look good and great size. I really am so please with these cups. "May I ask for the diameter of the top and bottom of this cup? I also want to know the height of this mug. Thank you!" "is the lip of the mug thicker or thinner than the correlle brand mugs?" Unfortunately I am unable to help in comparrison to the other item due to not having the item number. The lip on this mug is going to be pretty thin. It is not a very thick lip.